The School of Velocity was originally a product of London's closely meshed improv scene in which everyone had the chance to play with everyone at every possible opportunity. The multi-instrumentalist and guitarist Dave Tucker initiated the project in 1998. At this point in time, he had already written a little music history: at the end of the 70's, beginning of the 80's he was a member of the legendary (post) punkband, The Fall, and since the beginning of the 90's he has been garnering more and more attention in London's improv scene. Today he works, among others, in a duo with John Butcher, in a quartet with Phil Minton, Roger Turner and Pat Thomas, in projects with Louis Moloho or as a composer for the London Improvisers Orchestra. In this context, the School of Velocity was nothing more than another ad hoc group to which Tucker invited the drummer Steve Noble, the saxophonist Evan Parker and later, the bassist John Edwards. The penetrating power of this group as well as the willingness of the participants to allow differing music influences and to create an own music syntax from them lead, ultimately, to an extended studio session in the Spring of 2000. Its best parts are documented on Homework. The rock influences of Dave Tucker, the characteristic saxophone of Evan Parker, the muscular bass and the varied drums unite in the open improvisational structures, as typical for the British school. Evan Parker, perhaps the most significant and style forming saxophonist of the last thirty years, uses almost solely his tenor saxophone-which is also an index for how energetic this music is. And yet it never loses its transparency. Responsible for this is, on the one hand, the excellent production, done by the musicians themselves, and on the other, the sensitive, apparently radar guided acting by John Edwards and Steve Noble. 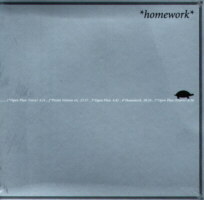 In short, Homework is an authentic document of a promising, new group!